Fundraising favouritism: Is the Cornwall Award fair? With the turnaround of the academic year here at Falmouth University comes the annual finance booklet, detailing the breakdown of income generated and total expenditure of the university for 2017/18. The release of the 2018/19 booklet has come just after the increase of students’ tuition fees, from £9000 to £9250, raising the ever looming question of what is our money actually being spent on? Now, I won’t bore you with all of the facts and figures, as the task of summarising the document would be no small feat. This could be partly due to the fact that despite the booklet trying to be concise and simple, using colourful graphics and charts, it is still very unclear at points. It leaves a lot down to interpretation, with the use of umbrella terms such as 1% of undergraduate fees being spent on “Welfare – Counselling, living support, chaplaincy, etc.” If other students are as curious as I am, they will be dying for a further information to know exactly where their impending debt is going. One figure that appears to have created a conflict of interest is that of the bursary funding. According to the booklet, £310 a year from every student goes towards bursaries for other students. This amounts to just under £1000 across the three years spent at university, which has the potential to seem wholly unfair to those who don’t need to claim in the first place. Yes, this is a fairly conservative view. Although, it’s a viewpoint that can be understood even if not agreed with. The knowledge that there is so-called ‘users’ of the system who can be categorised as fraudsters, diminishes the fact that there are students out there who actually depend on these bursaries. 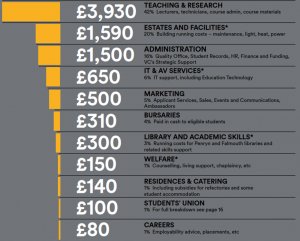 A breakdown of where our £9250 is spent. The types of bursaries awarded to students as highlighted by Will Wears, the Student Funding Manager at Woodlane Campus, are mainly categorised as the Disabled Students’ Allowance (DSA), low household income, or the Cornwall award which grants funds to students who lived in Cornwall before joining the university. This Cornwall award is the main talking point when it comes to unfair bursaries. Determined by post-code, who’s to say that that any one person is entitled to money more than the next person purely based on where they live? As an example, I am from Surrey. I fall in the lower bracket when it comes to student funding based on where I live and my household income. I am entitled to absolutely no additional funding, despite the fact my loan doesn’t even cover my rent. The way it works assumes too much of people. I am just as broke if not even more broke than the next student, yet the university still goes with the assumption that my parents will be throwing money at me, which is of course not the case at all. Is it fair that some students will be given upwards of £2000 across the course of their university career, on top of loans, purely for being Cornish? To gauge more of an understanding on how other students feel about this, I spoke with both Cornish students, and others who, like me, receive no extra funding. On the other side of the spectrum, there are students that receive no support, including Film student Albert O’Rourke. It is clear that I’m not alone in my views. Both Cornish and ‘outsiders’ reinforce the idea that a bursary solely for those from Cornwall is wholly unfair. An issue apparently in need of light. Am I sub-par just because I’m not Cornish?